Benjamin Netanyahu did President Obama a big favor: The Israeli prime minister didn’t offer any better alternative to dealing with Iran. Bibi’s speech inadvertently proved that the current negotiations are our best strategy for dealing with Iran. Israeli Prime Minister Benjamin Netanyahu is greeted by members of Congress as he arrives to speak at the Capitol on March 3, 2015, in Washington, D.C. Given how much buildup the speech received—and how much of America’s time has been wasted with the controversy surrounding it—it’s simply amazing that Netanyahu didn’t use the chance to offer any new or interesting ideas, any viable path to achieving the prevention of an Iranian nuclear weapon—which he insists is a shared goal with the United States—other than the one we are on now. From the first moment, the speech rang false. 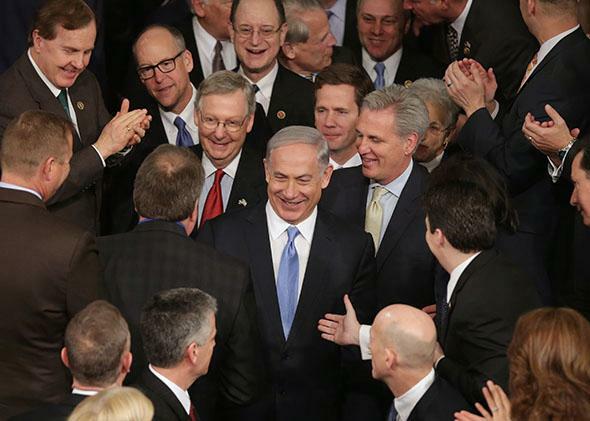 Netanyahu declared himself “deeply humbled” to be speaking before the Congress. Upon leaving Israel, he described his trip in wildly grandiose terms, declaring it a “historic mission.” Netanyahu may be many things, but humble isn’t one. He then voiced his “regret that some perceive my being here as political. That was never my intention.” Can Netanyahu really have not understood that an invitation planned in secret between his ambassador and the Republican House speaker would be seen as political? Aside from the initial ceremonial throat-clearing, however, the speech resembled those Netanyahu has given countless times before. Once again we heard that there is no meaningful distinction between Shiite Iran and Sunni ISIS, despite the fact that the two are currently at war. “Both want to impose a militant Islamic empire first on the region and then on the entire world,” Netanyahu said. “They just disagree among themselves who will be the ruler of that empire.” If the last decade should have taught us anything, it’s that it’s far wiser to disaggregate our adversaries than treat them as a monolith. We heard the familiar “apocalyptic mullah” argument. Iran is ruled by religious zealots driven to “fulfill the ideological mission of jihad,” he said. The message here is that, under such a government, Iran is uniquely immune to cost-benefit analysis that underpins conventional theories of deterrence, something I refer to as the “martyr state myth.” Again, this view is at odds with a strong U.S. and Israeli intelligence consensus, which holds that Iran pursues its national interests rationally. It’s precisely Tehran’s rational cost-benefit analysis that the U.S. and its partners in the P5+1 have been attempting to influence through the nuclear negotiations. After running down the list of Iran’s offenses, it came time for Netanyahu to offer his own alternative. And it was this: “The alternative to this bad deal is a much better deal.” That’s it. Negotiate harder, threaten more, and increase the pressure. Then Iran will capitulate. We talked about this speech for a month—for this? A lot of us would love a perfect deal that dismantled Iran’s whole program and removed any possibility whatsoever of an Iranian nuclear capability, but that’s not one of the options here. The question is whether we want the United States and its partners to walk away from a good-enough deal that keeps Iran far away from a nuke and puts its program under the heaviest inspections regime ever in the hope that we could possibly get a slightly better deal later. In the meantime, Iran would continue to move its program forward. That’s not a good idea. Netanyahu had the chance Tuesday to offer a better plan, with the whole world watching. He failed miserably, and in so doing demonstrated conclusively that there isn’t one. To the extent that this buttresses the Obama administration’s case for a deal—and it certainly should—the American people should be grateful to him.